Five Star Physician Services discovered immediate quality of care and operational benefit by switching from paper documentation to GEHRIMED™, and now views the software as a strategic business advantage. Prior to their GEHRIMED deployment, hand-written encounter notes were causing trouble with ICD-9 and later ICD-10 coding. Now Five Star has improved billing accuracy with GEHRIMED’s intuitive clinical data entry point and consistent reports. “Our practitioners can do a better job providing quality patient care with less paperwork, and our back-office staff spend less time solving billing problems,” Mr. Maynard says. Because GEHRIMED was built by long-term/post-acute (LTPAC) physicians for LTPAC practitioners, GERIMED helps Five Star and many other LTPAC practices to accomplish their mission without sacrificing revenue. Practitioners can focus on the patient. GEHRIMED’s sophisticated features streamline data entry so practitioners can focus on providing care, not chasing paperwork or struggling with technology. Their entire encounter sequence is part of a logical progression that matches the LTC workflow. The practitioners do not have to slow down and try to adapt to complicated workarounds for data entry that doesn’t apply to the LTPAC protocols. The Post-Acute/Long-Term Care clinical care practice views GEHRIMED as a strategic business advantage. The Five Star Physician Services website lists GEHRIMED as a top employment benefit. By switching to the industry’s leading LTPAC EHR solution, the clinicians at Five Star Physician Services have access to the most current patient information, securely, no matter where they take the call. And because Five Star Physician Services uses GEHRIMED’s Triage Notes, their clinicians simply enter notes into the application while those details are fresh in mind making them readily available for practitioners during subsequent patient encounters. Disjointed and potentially insecure communication through receptionists, SMS or text messages, and email no longer interfere with clinical data accessibility. Five Star Physician Services has found this great benefit with improved communication and documentation. 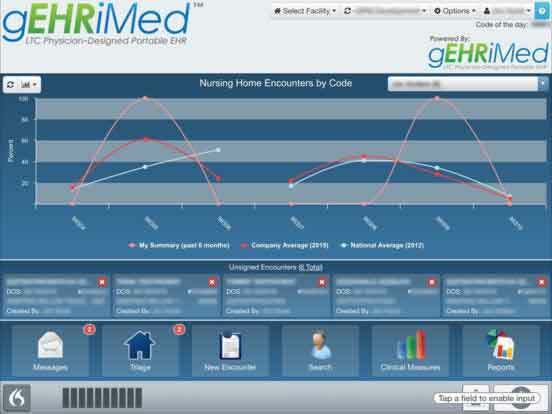 GEHRIMED helps in delivering quality patient care while maintaining practice efficiency. Five Star Physician Services is a leading LTPAC practice in the US Mid-Atlantic region. It offers innovative multi-specialty medical practice clinical leadership to facilities delivering sub-acute, rehabilitative, and palliative care. Five Star Physician Services provides Medical Directorships, Clinical Specialists, Attending Physicians, and Nurse Practitioners throughout Delaware, Maryland and Virginia. In addition, the company offers qualified operations, career, compliance, and administrative services. The company strives to provide exceptional quality patient care and establish effective alliances with the medical community. With GEHRIMED the practice found a strategic solution that meets their expanding business need.